Cardiovascular Disease (CVD) is a class of diseases that involve disorders of heart and blood vessels, including hypertension, coronary heart disease, cerebrovascular disease, peripheral vascular disease, which finally lead to Heart Failure (HF). There are several treatments available all over the world, but still, CVD and heart failure became the number one problem causing death every year worldwide. Both experimental and clinical studies have shown a role for inflammation in the pathogenesis of heart failure. 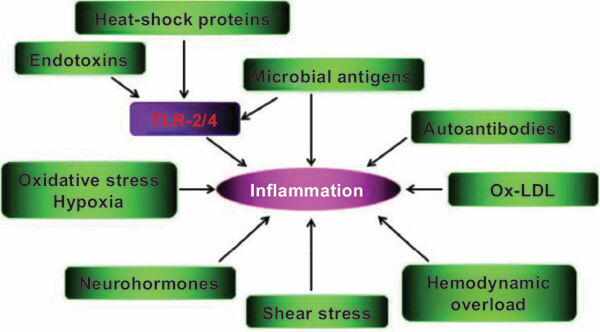 This seems related to an imbalance between pro-inflammatory and anti-inflammatory cytokines. Cardiac inflammation is a major pathophysiological mechanism operating in the failing heart, regardless of HF aetiology. Disturbances of the cellular and humoral immune system are frequently observed in heart failure. This review describes how B-cells play a specific role in the heart failure states. There is an urgent need to identify novel therapeutic targets and develop advanced therapeutic strategies to combat the syndrome of HF. Understanding and describing the elements of the humoral immunity function are essential and may suggest potential new treatment strategies. Inflammation, heart failure, myocardium, humoral immunity, B-cell, cardiovascular disease.